This religious tapestry "Christ Thorns Coronation" shows Jesus with his crown of thorns. Full of traditional "dolorosa" style religious style, we see Christ looking up toward heaven with a crown of thorns before his crucifixion. A golden halo surrounds his head to signify his pure and holy aura and spirit. A spiritual work that will enhance a spiritual area of a home. 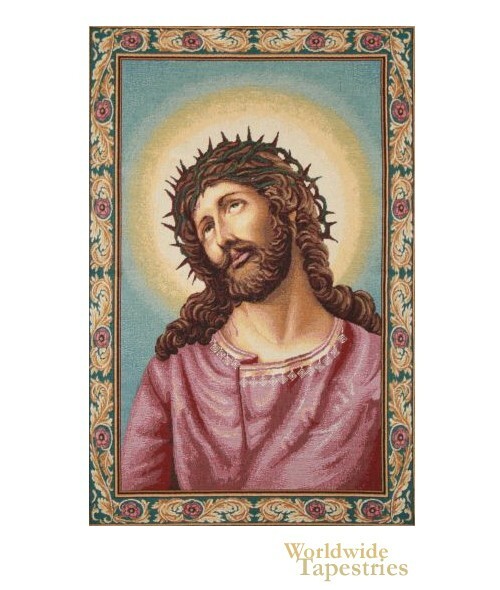 This religious art tapestry "Christ Thorns Coronation" is backed with a lining and has a tunnel for easy hanging. Dimensions: W 17" x H 26"